NOTE: We always recommend that you should have a survey carried out by a Gas Safe registered gas installer, HETAS installer or qualified NICEIC electrician (whichever is applicable to the goods you intend to purchase) to check and certify the compatibility of your chimney, flue, property and or circumstances prior to purchase to avoid disappointment. 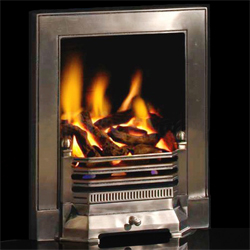 *Also due to the sheer number of varying flue boxes it is not possible to know which fires are suitable until such time as the existing fire has been removed. Please note that whilst soot deposits on a gas fire are quite normal and to be expected, they will be more visible on a pebble fuel effect and or a light coloured fireback. Also be aware that due to the fire producing heat the interior of the fire may become marked over time through general wear and tear. We also recommend that you should wait until you have the goods purchased, onsite, in your possession to take accurate measurements from before proceeding to carry out any building work or create any apertures in the wall to avoid potential costly mistakes being made, as manufacturers reserve the right to alter products or specifications without any prior notice as required. gas suites. Whatever your requirements you are always guaranteed a warm welcome by our friendly sales team!